The asteroid Euphrosyne glides across a field of background stars in this time-lapse view from NASA’s WISE spacecraft. WISE obtained the images used to create this view over a period of about a day around May 17, 2010, during which it observed the asteroid four times. Because WISE (renamed NEOWISE in 2013) is an infrared telescope, it senses heat from asteroids. Euphrosyne is quite dark in visible light, but glows brightly at infrared wavelengths. This view is a composite of images taken at four different infrared wavelengths: 3.4 microns (color-coded blue), 4.6 microns (cyan), 12 microns (green) and 22 microns (red). The moving asteroid appears as a string of red dots because it is much cooler than the distant background stars. Stars have temperatures in the thousands of degrees, but the asteroid is cooler than room temperature. Thus the stars are represented by shorter wavelength (hotter) blue colors in this view, while the asteroid is shown in longer wavelength (cooler) reddish colors. The WISE spacecraft was put into hibernation in 2011 upon completing its goal of surveying the entire sky in infrared light. WISE cataloged three quarters of a billion objects, including asteroids, stars and galaxies. In August 2013, NASA decided to reinstate the spacecraft on a mission to find and characterize more asteroids. › A new NASA study has traced some members of the near-Earth asteroid population back to their likely source. › The source may be the Euphrosyne family of dark, asteroids on highly inclined (or tilted) orbits in the outer asteroid belt. › The study used data from NASA’s NEOWISE space telescope, which has a second life following its reactivation in 2013. High above the plane of our solar system, near the asteroid-rich abyss between Mars and Jupiter, scientists have found a unique family of space rocks. These interplanetary oddballs are the Euphrosyne(pronounced you-FROH-seh-nee) asteroids, and by any measure they have been distant, dark and mysterious — until now. Distributed at the outer edge of the asteroid belt, the Euphrosynes have an unusual orbital path that juts well above the ecliptic, the equator of the solar system. The asteroid after which they are named, Euphrosyne — for an ancient Greek goddess of mirth — is about 156 miles (260 kilometers) across and is one of the 10 largest asteroids in the main belt. Current-day Euphrosyne is thought to be a remnant of a massive collision about 700 million years ago that formed the family of smaller asteroids bearing its name. Scientists think this event was one of the last great collisions in the solar system. A new study conducted by scientists at NASA’s Jet Propulsion Laboratory in Pasadena, California, used the agency’s orbiting Near-Earth Object Wide-field Infrared Survey Explorer (NEOWISE) telescope to look at these unusual asteroids to learn more about Near Earth Objects, or NEOs, and their potential threat to Earth. NEOs are bodies whose orbits around the sun approach the orbit of Earth; this population is short-lived on astronomical timescales and is fed by other reservoirs of bodies in our solar system. As they orbit the sun, NEOs can occasionally have close approaches to Earth. For this reason alone — the safety of our home planet — the study of such objects is important. As a result of their study, the JPL researchers believe the Euphrosynes may be the source of some of the dark NEOs found to be on long, highly inclined orbits. They found that, through gravitational interactions with Saturn, Euphrosyne asteroids can evolve into NEOs over timescales of millions of years. NEOs can originate in either the asteroid belt or the more distant outer reaches of the solar system. Those from the asteroid belt are thought to evolve toward Earth’s orbit through collisions and the gravitational influence of the planets. Originating well above the ecliptic and near the far edge of the asteroid belt, the forces that shape their trajectories toward Earth are far more moderate. By studying the Euphrosyne family asteroids with NEOWISE, JPL scientists have been able to measure their sizes and the amount of solar energy they reflect. Since NEOWISE operates in the infrared portion of the spectrum, it detects heat. Therefore, it can see dark objects far better than telescopes operating at visible wavelengths, which sense reflected sunlight. Its heat-sensing capability also allows it to measure sizes more accurately. The 1,400 Euphrosyne asteroids studied by Masiero and his colleagues turned out to be large and dark, with highly inclined and elliptical orbits. These traits make them good candidates for the source of some of the dark NEOs the NEOWISE telescope detects and discovers, particularly those that also have highly inclined orbits. NEOWISE was originally launched as an astrophysics mission in 2009 as the Wide-field Infrared Survey Explorer, or WISE. It operated until 2011 and was then shut down. But the spacecraft, now dubbed NEOWISE, would get a second life. “NEOWISE is a great tool for searching for near-Earth asteroids, particularly high-inclination, dark objects,” Masiero said. There are over 700,000 asteroidal bodies currently known in the main belt that range in size from large boulders to about 60 percent of the diameter of Earth’s moon, with many yet to be discovered. This makes finding the specific point of origin of most NEOs extremely difficult. A better understanding of the origins and behaviors of these mysterious objects will give researchers a clearer picture of asteroids in general, and in particular the NEOs that skirt our home planet’s neighborhood. Such studies are important, and potentially critical, to the future of humanity, which is a primary reason JPL and its partners continue to relentlessly track these wanderers within our solar system. To date, U.S. assets have discovered more than 98 percent of the known NEOs. NASA’s Jet Propulsion Laboratory in Pasadena, California, manages the NEOWISE mission for NASA’s Science Mission Directorate in Washington. The Space Dynamics Laboratory in Logan, Utah, built the science instrument. Ball Aerospace & Technologies Corp. of Boulder, Colorado, built the spacecraft. Science operations and data processing take place at the Infrared Processing and Analysis Center at the California Institute of Technology in Pasadena. Caltech manages JPL for NASA. NASA’s Near-Earth Object Program at NASA Headquarters, Washington, manages and funds the search, study and monitoring of asteroids and comets whose orbits periodically bring them close to Earth. JPL manages the Near-Earth Object Office for NASA’s Science Mission Directorate in Washington. Imagine trying to create a map of your house while confined to only the living room. You might peek through the doors into other rooms or look for light spilling in through the windows. But, in the end, the walls and lack of visibility would largely prevent you from seeing the big picture. The job of mapping our own Milky Way galaxy from planet Earth, situated about two-thirds of the way out from the galaxy’s center, is similarly difficult. Clouds of dust permeate the Milky Way, blocking our view of the galaxy’s stars. Today, researchers have a suitable map of our galaxy’s spiral structure, but, like early explorers charting new territory, they continue to patiently and meticulously fill in the blanks. Recently, researchers have turned to a new mapping method that takes advantage of data from NASA’s Wide-field Infrared Survey Explorer, or WISE. Using WISE, the research team has discovered more than 400 dust-shrouded nurseries of stars, which trace the shape of our galaxy’s spiral arms. Seven of these “embedded star clusters” are described in a new study published online May 20 in the Monthly Notices of the Royal Astronomical Society. “The sun’s location within the dust-obscured galactic disk is a complicating factor to observe the galactic structure,” said Denilso Camargo, lead author of the paper from the Federal University of Rio Grande do Sul in Brazil. The results support the four-arm model of our galaxy’s spiral structure. 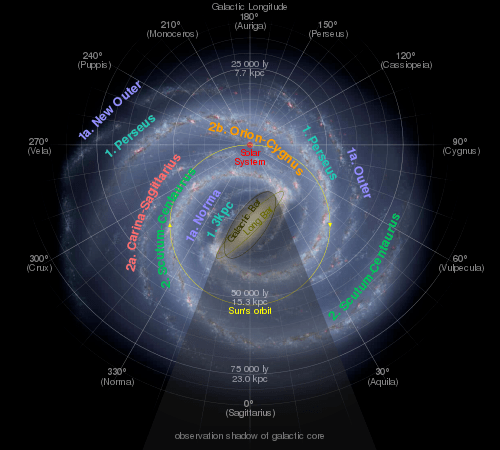 For the last few years, various methods of charting the Milky Way have largely led to a picture of four spiral arms. The arms are where most stars in the galaxy are born. They are stuffed with gas and dust, the ingredients of stars. Two of the arms, called Perseus and Scutum-Centaurus, seem to be more prominent and jam-packed with stars, while the Sagittarius and Outer arms have as much gas as the other two arms but not as many stars. The new WISE study finds embedded star clusters in the Perseus, Sagittarius, and Outer arms. Data from the Two Micron All Sky Survey (2MASS), a ground-based predecessor of WISE from NASA, the National Science Foundation and the University of Massachusetts, Amherst, helped narrow down the distances to the clusters and pinpoint their location. Embedded star clusters are a powerful tool for visualizing the whereabouts of spiral arms because the clusters are young, and their stars haven’t yet drifted away and out of the arms. Stars begin their lives in the dense, gas-rich neighborhoods of spiral arms, but they migrate away over time. These embedded star clusters complement other techniques for mapping our galaxy, such as those used by radio telescopes, which detect the dense gas clouds in spiral arms. “Spiral arms are like traffic jams in that the gas and stars crowd together and move more slowly in the arms. 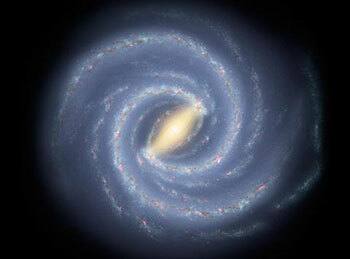 As material passes through the dense spiral arms, it is compressed and this triggers more star formation,” said Camargo. WISE is ideal for finding the embedded star clusters because its infrared vision can cut through the dust that fills the galaxy and shrouds the clusters. What’s more, WISE scanned the whole sky, so it was able to perform a thorough survey of the shape of our Milky Way. NASA’s Spitzer Space Telescope also uses infrared images to map the Milky Way’s territory. Spitzer looks along specific lines of sight and counts stars. The spiral arms will have the densest star populations. NASA’s Jet Propulsion Laboratory in Pasadena, California managed and operated WISE for NASA’s Science Mission Directorate in Washington. The spacecraft was put into hibernation mode in 2011, after it scanned the entire sky twice, thereby completing its main objectives. In September 2013, WISE was reactivated, renamed NEOWISE and assigned a new mission to assist NASA’s efforts to identify potentially hazardous near-Earth objects. Other authors of the study are: Charles Bonatto and Eduardo Bica, also with the Federal University of Rio Grande do Sul. |Jet Propulsion Laboratory, Pasadena, Calif.
Immense black holes are common at the cores of galaxies, but finding one this big so “far back” in the cosmos is rare. Because light from the galaxy hosting the black hole has traveled 12.5 billion years to reach us, astronomers are seeing the object as it was in the distant past. The black hole was already billions of times the mass of our sun when our universe was only a tenth of its present age of 13.8 billion years. The new study outlines three reasons why the black holes in the ELIRGs could have grown so massive. First, they may have been born big. In other words, the “seeds,” or embryonic black holes, might be bigger than thought possible. If a black hole spins slowly enough, it won’t repel its meal as much. In the end, a slow-spinning black hole can gobble up more matter than a fast spinner. More research is needed to solve this puzzle of these dazzlingly luminous galaxies. The team has plans to better determine the masses of the central black holes. Knowing these objects’ true hefts will help reveal their history, as well as that of other galaxies, in this very crucial and frenzied chapter of our cosmos. “We found in a related study with WISE that as many as half of the most luminous galaxies only show up well in infrared light,” said Tsai. NASA’s Jet Propulsion Laboratory, Pasadena, Calif., manages the Wide-field Infrared Survey Explorer for NASA’s Science Mission Directorate, Washington. The mission’s principal investigator, Edward L. (Ned) Wright, is at UCLA. The mission was competitively selected in 2002 under NASA’s Explorers Program managed by the Goddard Space Flight Center, Greenbelt, Md. The science instrument was built by the Space Dynamics Laboratory, Logan, Utah, and the spacecraft was built by Ball Aerospace & Technologies Corp, Boulder, Colo. Science operations and data processing will take place at the Infrared Processing and Analysis Center at the California Institute of Technology in Pasadena. Caltech manages JPL for NASA. The mission’s education and public outreach office is based at the University of California, Berkeley. The view from newborn stars found far above the Milky Way’s plane would have a (heavily obscured) view of the galactic disk. Astronomers have found two just-born star clusters, part of our galaxy’s stellar disk, that float an incredible 16,000 light-years above the plane of the Milky Way. Two clusters of stars, still embedded in their natal clouds of dust and gas, are floating 16,000 light-years above the pancake-shaped disk of the Milky Way. Denilso Camargo (Colegio Militar de Porto Alegre, Brazil) and colleagues reported the surprising find, part of a larger study of embedded star clusters in Wide-field Infrared Survey Explorer (WISE) data, in the February 26th Monthly Notices of the Royal Astronomical Society. The Milky Way is a paper-thin spiral galaxy, with 85% of its stars in a disk about 100,000 light-years across and only 3,000 light-years tall. A thicker and sparser disk of older stars extends up to 16,000 light-years above the galactic plane. The two disks appear to contain distinct stellar populations — the thick disk likely forged stars at an earlier stage of the Milky Way’s formation. So the discovery of new stars so far above the galactic plane, firmly in thick disk territory, is unexpected to say the least. No other such high-altitude star clusters have ever been found, even though violent supernova explosions have ejected plenty of molecular hydrogen clouds high above the galaxy’s plane, any of which could potentially form stars given the right trigger. The star clusters themselves are only about 2 million years old. Their age, distance, and mass come from models that Camargo’s team fit to the color and brightness measurements of their stellar populations. At an altitude of 16,000 light-years, the 33 and 42 stars belonging to clusters Camargo 438 and Camargo 439, respectively, have an exceptional (if heavily obscured) outsider’s view of the Milky Way’s spiral design. But they won’t for long, astronomically speaking. The authors calculated the velocity of the cloud containing the young and still-forming stars, and they find that the cloud has crossed paths with the disk before, sometime between 45 and 50 million years ago, an event that likely caused the clouds to condense and form stars. The clusters will cross paths with the disk again in another 50 million years or so. Like early explorers mapping the continents of our globe, astronomers are busy charting the spiral structure of our galaxy, the Milky Way. 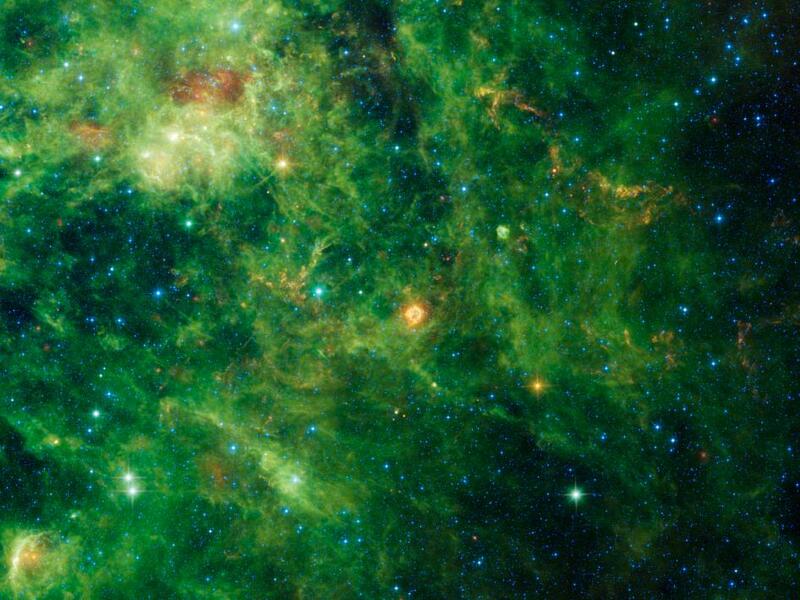 Using infrared images from NASA’s Spitzer Space Telescope, scientists have discovered that the Milky Way’s elegant spiral structure is dominated by just two arms wrapping off the ends of a central bar of stars. Astronomers using data from NASA’s Wide-field Infrared Survey Explorer, or WISE, have found a cluster of stars forming at the very edge of our Milky Way galaxy. The discovery, led by Denilso Camargo of the Federal University of Rio Grande do Sul in Porto Alegre, Brazil, appears in a new study in the journal Monthly Notices of the Royal Astronomical Society. The Milky Way, the galaxy we live in, has a barred spiral shape, with arms of stars, gas and dust winding out from a central bar. Viewed from the side, the galaxy would appear relatively flat, with most of the material in a disk and the central regions. from the galactic plane are rare and, in general, are not expected to form stars. Over 11,000 years ago, a massive, supergiant star came to the end of its life. The star’s core collapsed to form an incredibly dense ball of neutrons, and its exterior was blasted away in an immense release of energy astronomers call a supernova. 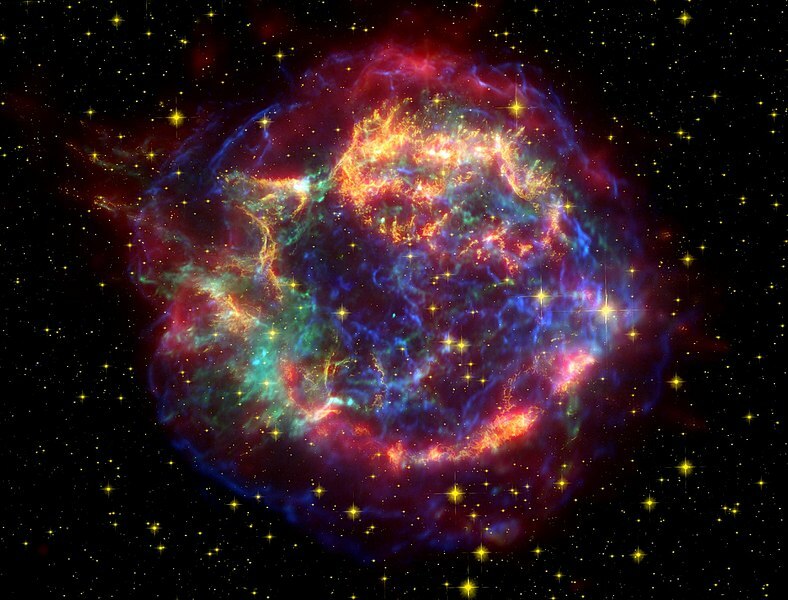 The light from this supernova first reached Earth from the direction of the constellation Cassiopeia around 1667 A.D. If anyone alive at the time saw it, they left no records. It is likely that large amounts of dust between the dying star and Earth dimmed the brightness of the explosion to the point that it was barely, if at all, visible to the unaided eye. The remnant of this supernova was discovered in 1947 from its powerful radio emission. Listed as Cassiopia A, it is one of the brightest radio sources in the whole sky. More recently, the Wide-field Infrared Survey Explorer (WISE), detected infrared echoes of the flash of light rippling outwards from the supernova. In the image, the central bright cloud of dust is the blast wave moving through interstellar space heating up dust as it goes. The blast wave travels fast – at about six percent the speed of light. By the time WISE took this image, the blast wave has expanded out to about a distance of 21 light-years from the original explosion. The flash of light from the explosion, traveling at the speed of light, has covered well over 300 light-years. The orange-colored echoes further out from the central remnant are from interstellar dust that was heated by the supernova flash centuries after the original explosion. The colors used in this image represent specific wavelengths of infrared light. Blue and cyan (blue-green) represent light emitted predominantly from stars at wavelengths of 3.4 and 4.6 microns. Green and red represent light mostly emitted by dust at 12 and 22 microns, respectively. A false color image of Cassiopeia A (Cas A) using observations from both the Hubble and Spitzer telescopes as well as the Chandra X-ray Observatory (cropped). When an image from NASA’s Chandra X-ray Observatory of PSR B1509-58 — a spinning neutron star surrounded by a cloud of energetic particles –was released in 2009, it quickly gained attention because many saw a hand-like structure in the X-ray emission. Do you see any recognizable shapes in this nebulous region captured by NASA’s WISE and Chandra missions? In a new image of the system, X-rays from Chandra in gold are seen along with infrared data from NASA’s Wide-field Infrared Survey Explorer (WISE) telescope in red, green and blue. Pareidolia may strike again as some people report seeing a shape of a face in WISE’s infrared data. What do you see? NASA’s Nuclear Spectroscopic Telescope Array, or NuSTAR, also took a picture of the neutron star nebula in 2014, using higher-energy X-rays than Chandra. JPL, a division of the California Institute of Technology in Pasadena, manages the WISE mission for NASA. NASA’s Marshall Space Flight Center in Huntsville, Alabama, manages the Chandra program for. The Smithsonian Astrophysical Observatory in Cambridge, Massachusetts, controls Chandra’s science and flight operations. More information is online at http://www.nasa.gov/wise and http://wise.astro.ucla.edu and http://www.jpl.nasa.gov/wise. 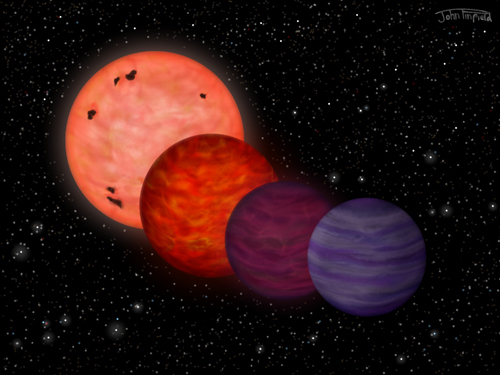 Astronomers have discovered an extremely cool object that could have a particularly diverse history—although it is now as cool as a planet, it may have spent much of its youth as hot as a star. The current temperature of the object is 200 to 300 degrees Fahrenheit (100 to 150 degrees Celsius), which is intermediate between that of the Earth and of Venus. However, the object shows evidence of a possible ancient origin, implying that a large change in temperature has taken place. In the past this object would have been as hot as a star for many millions of years. Called WISE J0304-2705, the object is a member of the recently established “Y dwarf” class—the coolest stellar temperature class yet defined, following the other classes O, B, A, F, G, K, M, L, and T. Although the temperature is similar to that of the planets, the object is dissimilar to the rocky Earth-like planets, and instead is a giant ball of gas like Jupiter. 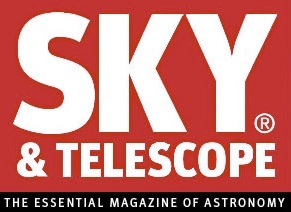 The international discovery team, led by David Pinfield from the University of Hertfordshire and including Carnegie’s Yuri Beletsky, identified the Y dwarf using the WISE observatory—a NASA space telescope that has imaged the entire sky in the mid-infrared. The team also measured the spectrum of light emitted by the Y dwarf, which allowed them to determine its current temperature and better understand its history. Their work is published by Monthly Notices of the Royal Astronomical Society. Only 20 other Y dwarfs have been discovered to-date, and amongst these WISE J0304-2705 is defined as “peculiar” due to unusual features in its emitted light spectrum. The reason that WISE J0304-2705 undergoes such extensive evolutionary cooling is because it is “sub-stellar,” meaning its interior never gets hot enough for hydrogen fusion, the process that has kept our Sun hot for billions of years, and without an energy source maintaining a stable temperature, cooling and fading is inevitable. If WISE J0304-2705 is an ancient object, then its temperature evolution would have followed through an understood series of stages: During its first approximately 20 million years it would have a temperature of at least 5,100 degrees Fahrenheit (2800 degrees Celsius), the same as red dwarf stars like Proxima Centauri (the nearest star to the Sun). After 100 million years it would have cooled to about 2,700 degrees Fahrenheit (1,500 degrees Celsius), with silicate clouds condensing out in its atmosphere. At a billion years of age it would have cooled to about 1,800 degrees Fahrenheit (1,000 degrees Celsius), so cool that methane gas and water vapor would dominate its appearance. And since then it would have continued to cool to its current temperature, barely enough to boil water for a cup of tea. WISE J0304-2705 is as massive as 20-30 Jupiters combined, which is intermediate between the more massive stars and typical planets. But in terms of temperature it may have actually “taken the journey” from star-like to planet-like conditions. Having identified WISE 0304-2705, Pinfield’s team made crucial ground-based observations with some of the world’s largest telescopes—the 8-meter Gemini South Telescope, the 6.5-meter Magellan Telescope and the European Southern Observatory’s 3.6-meter New Technology Telescope, all located in the Chilean Andes. Team member Mariusz Gromadzki said: “The ground based measurements were very challenging, even with the largest telescopes. It was exciting when the results showed just how cool this object was, and that it was unusual”. “The discovery of WISE J0304-2705, with its peculiar light spectrum, poses ongoing challenges for the most powerful modern telescopes that are being used for its detailed study” remarked Maria Teresa Ruiz, team member from the Universidad de Chile. WISE J0304-2705 is located in the Fornax (Furnace) constellation, belying its cool temperature. There is currently no lower limit for Y dwarf temperatures, and there could be many even cooler and more diverse objects un-detected in the solar neighborhood. WISE went into hibernation in February 2011 after carrying out its main survey mission. However, by popular demand it was revived in December 2013, and is continuing to observe as part of a three-year mission extension [Neowise]. The Gemini Observatory consists of twin 8.1-meter diameter optical/infrared telescopes located on two of the best observing sites on the planet. From their locations on mountains in Hawai‘i and Chile, Gemini Observatory’s telescopes can collectively access the entire sky. Gemini was built and is operated by a partnership of six countries including the United States, Canada, Chile, Australia, Brazil and Argentina. Any astronomer in these countries can apply for time on Gemini, which is allocated in proportion to each partner’s financial stake. A survey of more than 170,000 supermassive black holes, using NASA’s Wide-field Infrared Survey Explorer (WISE), has astronomers reexamining a decades-old theory about the varying appearances of these interstellar objects. This image shows galaxies clumped together in the Fornax cluster, located 60 million light-years from Earth. 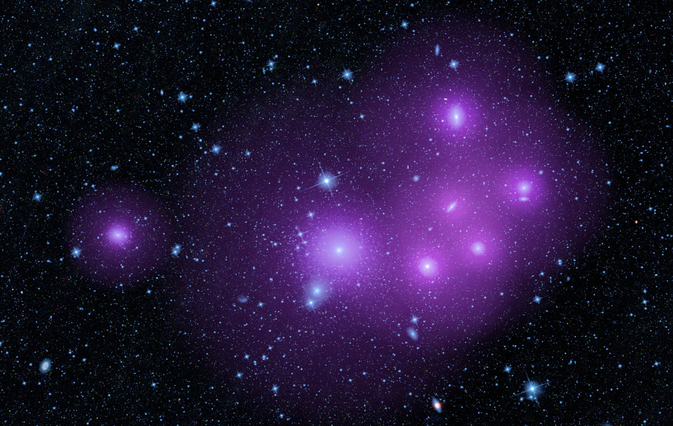 The picture was taken by WISE, but has been artistically enhanced to illustrate the idea that clumped galaxies will, on average, be surrounded by larger halos of dark matter (purple). The unified theory of active, supermassive black holes, first developed in the late 1970s, was created to explain why black holes, though similar in nature, can look completely different. Some appear to be shrouded in dust, while others are exposed and easy to see. The unified model answers this question by proposing that every black hole is surrounded by a dusty, doughnut-shaped structure called a torus. Depending on how these “doughnuts” are oriented in space, the black holes will take on various appearances. For example, if the doughnut is positioned so that we see it edge-on, the black hole is hidden from view. If the doughnut is observed from above or below, face-on, the black hole is clearly visible. However, the new WISE results do not corroborate this theory. The researchers found evidence that something other than a doughnut structure may, in some circumstances, determine whether a black hole is visible or hidden. The team has not yet determined what this may be, but the results suggest the unified, or doughnut, model does not have all the answers. Yan is the second author of the research accepted for publication in the Astrophysical Journal. The lead author is post-doctoral researcher, Emilio Donoso, who worked with Yan at IPAC and has since moved to the Instituto de Ciencias Astronómicas, de la Tierra y del Espacio in Argentina. The research also was co-authored by Daniel Stern at NASA’s Jet Propulsion Laboratory (JPL) in Pasadena, and Roberto Assef of Universidad Diego Portales in Chile and formerly of JPL. Every galaxy has a massive black hole at its heart. The new study focuses on the “feeding” ones, called active, supermassive black holes, or active galactic nuclei. These black holes gorge on surrounding gas material that fuels their growth. With the aid of computers, scientists were able to pick out more than 170,000 active supermassive black holes from the WISE data. They then measured the clustering of the galaxies containing both hidden and exposed black holes — the degree to which the objects clump together across the sky. If the unified model was true, and the hidden black holes are simply blocked from view by doughnuts in the edge-on configuration, then researchers would expect them to cluster in the same way as the exposed ones. According to theory, since the doughnut structures would take on random orientations, the black holes should also be distributed randomly. It is like tossing a bunch of glazed doughnuts in the air — roughly the same percentage of doughnuts always will be positioned in the edge-on and face-on positions, regardless of whether they are tightly clumped or spread far apart. But WISE found something totally unexpected. The results showed the galaxies with hidden black holes are more clumped together than those of the exposed black holes. If these findings are confirmed, scientists will have to adjust the unified model and come up with new ways to explain why some black holes appear hidden. Another way to understand the WISE results involves dark matter. Dark matter is an invisible substance that dominates matter in the universe, outweighing the regular matter that makes up people, planets and stars. Every galaxy sits in the center of a dark matter halo. 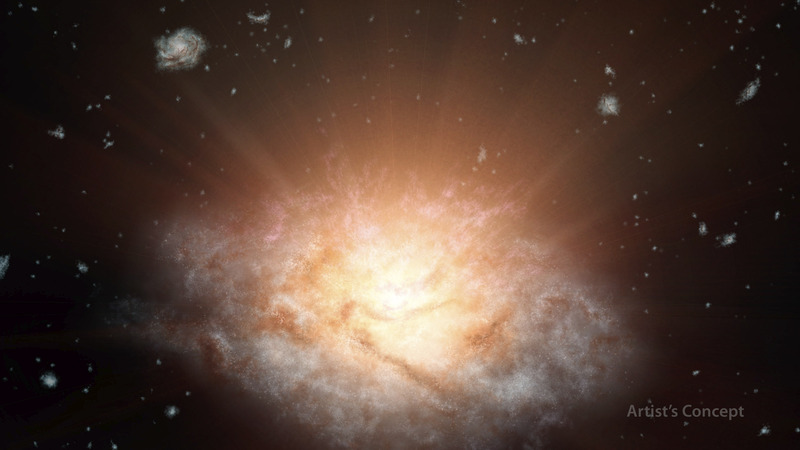 Bigger halos have more gravity and, therefore, pull other galaxies toward them. Because WISE found that the obscured black holes are more clustered than the others, the researchers know those hidden black holes reside in galaxies with larger dark matter halos. Though the halos themselves would not be responsible for hiding the black holes, they could be a clue about what is occurring. Scientists still are actively combing public data from WISE, put into hibernation in 2011 after scanning Earth’s entire sky twice. WISE was reactivated in 2013, renamed NEOWISE, and given a new mission to identify potentially hazardous near-Earth objects. Articles like this are the reason I come back for more. NASA’s Wide-field Infrared Survey Explorer (WISE) and Spitzer Space Telescope have discovered what appears to be the coldest “brown dwarf” known — a dim, star-like body that surprisingly is as frosty as Earth’s North Pole. Images from the space telescopes also pinpointed the object’s distance to 7.2 light-years away, earning it the title for fourth closest system to our sun. 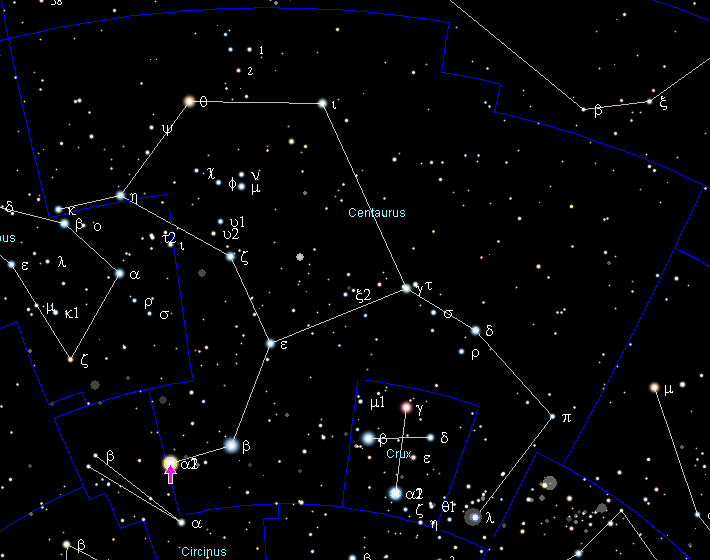 The closest system, a trio of stars, is Alpha Centauri, at about 4 light-years away. WISE was able to spot the rare object because it surveyed the entire sky twice in infrared light, observing some areas up to three times. Cool objects like brown dwarfs can be invisible when viewed by visible-light telescopes, but their thermal glow — even if feeble — stands out in infrared light. In addition, the closer a body, the more it appears to move in images taken months apart. Airplanes are a good example of this effect: a closer, low-flying plane will appear to fly overhead more rapidly than a high-flying one. After noticing the fast motion of WISE J085510.83-071442.5 in March of 2013, Luhman spent time analyzing additional images taken with Spitzer and the Gemini South telescope on Cerro Pachon in Chile. 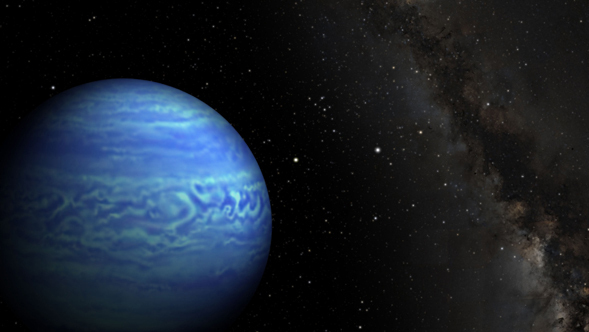 Spitzer’s infrared observations helped determine the frosty temperature of the brown dwarf. Combined detections from WISE and Spitzer, taken from different positions around the sun, enabled the measurement of its distance through the parallax effect. This is the same principle that explains why your finger, when held out right in front of you, appears to jump from side to side when you alternate left- and right-eye views.